Testing and reviewing portable speakers is at times confusing. With a variety of designs, different features and prices, evaluating them against one another and delivering an overall verdict is difficult. The Raikko PARTY X1 speaker is a capsule speaker with a single 45mm 3 watt speaker driver. We think the best in class at the moment of the capsule speakers of this size are the X-mini UNO and the Bluetooth X-mini KAI2. When the PARTY X1 is compared with these they offer impressive bass and overall more depth in all the ranges; and the reason for this is probably because the newer X-mini speakers have added ceramic drivers and weight to the base of the units, increasing the potential depths the single driver can accomplish. The Raikko PARTY X1 speaker in its own right sounds fine, with good acoustics in the mid-high ranges, and will quench most people's desire for a simple volume and quality boost over their inbuilt phone speaker. It fills a room with sound and doesn't reverberate; even at full volume with tracks with lots of bass. But at a price of £59 and €59, it's pricier than the comparable wireless X-mini KAI 2 speaker, which is £39.95. Raikko's rectangular design with smooth rounded corners looks smart and perhaps more serious than many other capsule speakers we've previously reviewed. The overall unit is solid and robust and it's supplied with a carry bag for added protection when travelling. A design addition which sets the image of the PARTY X1 is a strip of aluminium that is wrapped around the speaker's body and comes in a variety of colours which include, black, red, blue, green and yellow. It does have some novel additions, like its quirky ability to vocally announce input methods and status of connection; and has the standard four onboard buttons neatly arranged in a row to skip (volume control when held down) and pause/play music. And because this speaker has an acceptable quality inbuilt microphone you can answer and hang up calls via the red button on the right. The Raikko PARTY X1 does unfortunately discriminate against Bluetooth in favour of wired auxiliary connections (also included is a micro-SD card slot), because the cable method sounds much louder and clearer. We had no issues with the Bluetooth performance; the range was plentiful at around ten metres and re-pairing was snappy too. Also, depending on the method of connectivity used, the battery life can last anywhere between 4-8 hours. 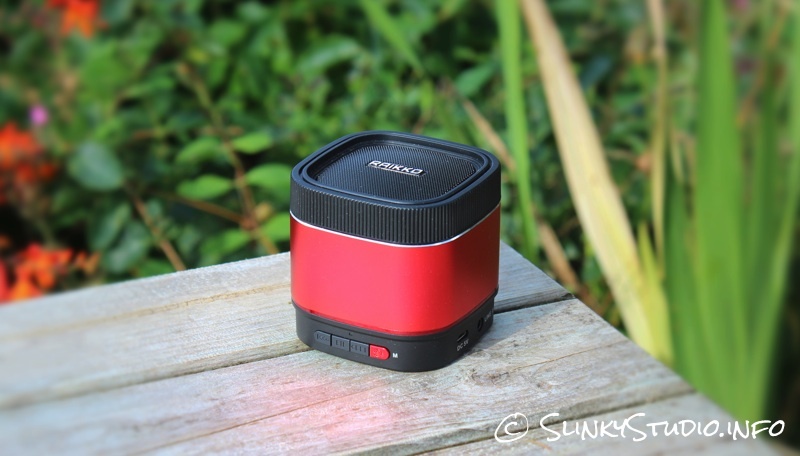 We think the Raikko PARTY X1 speaker is a well thought out portable Bluetooth speaker. But when we have the options previously mentioned available for less money, that deliver better overall audio quality and bigger volume, this one is left in the shadows.